Not-so-newly-married-but-still-newish couple living in a house that is gradually getting used to its first (but, it hopes, not the last) dwellers. Still a lot of blank walls. See what happens... (slowly and painfully). We’ve been blogging at www.whatthevita.com ever since we made the big move, but this old blog has been getting new followers and subscribers. Which is awesome, I love that you want to hear about what we’re doing around the house, but I’m not posting here anymore. Come over to www.whatthevita.com and subscribe/follow us there instead! No, we didn’t move to a new house…. at least, not yet! I finally bit the dust and got our own URL, so from now on you can find us at www.whatthevita.com! Please update your subscriptions and feed settings… and go over there right now to see what’s been happening at our casa! Thanks for reading!! And I hope to see you over there!! Well, I promised you that I would be back today with an awesome addition to our laundry room. Unfortunately, my plans have been thwarted by dumb electricity. I mean, who needs electricity in the laundry room? Don’t we all wash our clothes on a washboard? Basically, the area where I planned to drill in some screws is apparently filled with electrical lines. Or so says my stud finder. I’m still hoping that it changes its mind, but no luck so far. A few months ago, I saw this very cool home at Brick House that had this clever solution for hanging up clothes sans closet. Pipes! 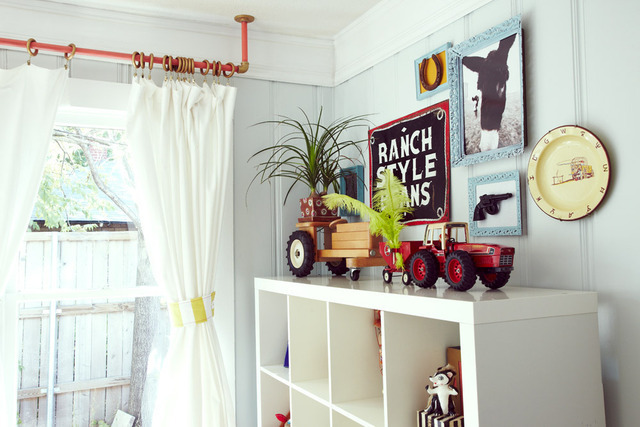 I loved how industrial this looked and I knew it would be a great solution for our laundry room (not). Pipes, painted coral and gold, holding up curtains? SO COOL. I’m sad just thinking about it. I tried moving it in different configurations and using two different pipe sizes, but I just couldn’t find a way to make it work and have it look good. 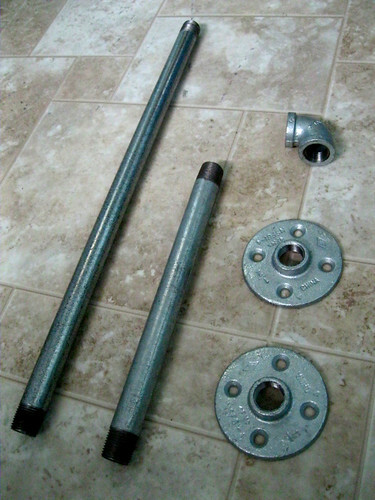 I’ll find another way to hang up wet clothes, but I’ll also have to find another use for my pipes and floor flanges. I’ll need to find another use for my pipes. Perhaps they can become legs for my jewelry cabinet, a la Brick House’s dipped legs. Fortunately, a little elfin worked very hard to cheer me up today. 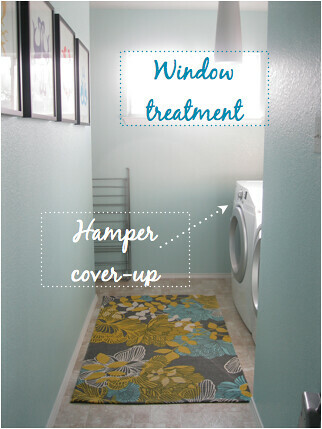 We just found the perfect rug for the laundry room… and that forced me to make some hard, life-altering decisions. But now I look back on it and realize that it was the best thing to ever happen to me. The rug is from Urban Outfitters. I really enjoy their rug selection – the rugs are always well-designed and reasonably priced. I’ve been checking their website constantly, hoping for a suitable rug for either the laundry room or the green bathroom. 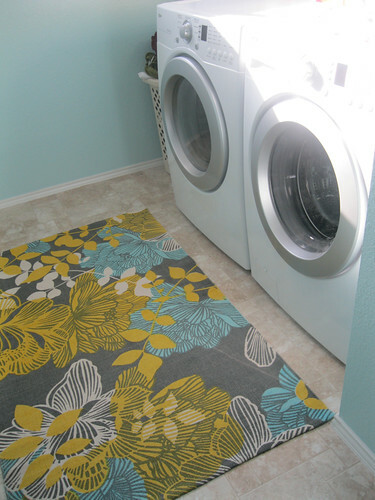 I was really thrilled to find this rug – the colors are PERFECT for the laundry room. The blue on the rug is a CLOSE match to our walls… it’s basically a shade darker of the same color. It’s serendipity, I tell you. And the dark gray… you know it. 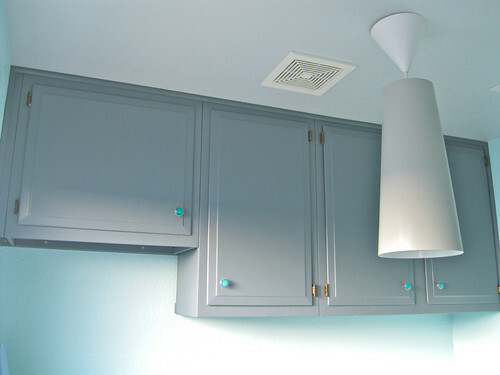 Goes perfectly with our dark gray cabinets. Of course, a new purchase for the house ALWAYS leads to more decisions that we need to make. 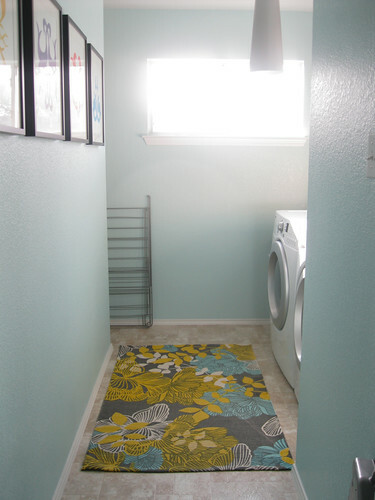 I’ve been thinking about choosing fabrics for the laundry room for a while, but wanted to wait until we got a rug because it’s easier to find fabrics to go with a rug than to find a rug to go with fabric choices. 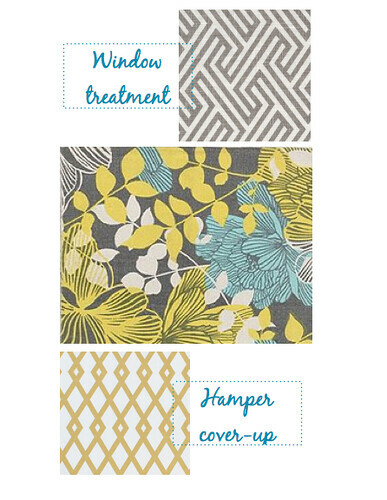 I just went straight to Tonic Living, because I really like their fabric selection. There are many other online fabric shops, but they have SO MANY FABRIC CHOICES that it’s easy to get overwhelmed at these sites. 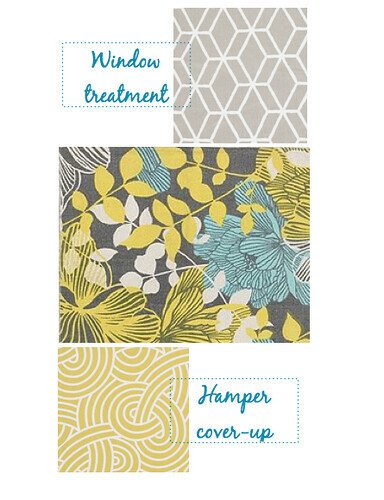 I still got overwhelmed at Tonic Living with all the great fabrics, so I just narrowed it down and down until I had several choices. Then I put them all around a photo of my rug. I used the Pages application for this step. 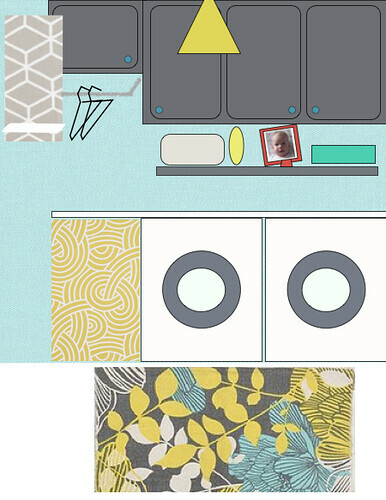 As you can see, I also put a dark gray background at the top and a light blue background at the bottom to see how the fabrics would look with our two main colors in the room. I really like both choices, but I liked the second one slightly better. 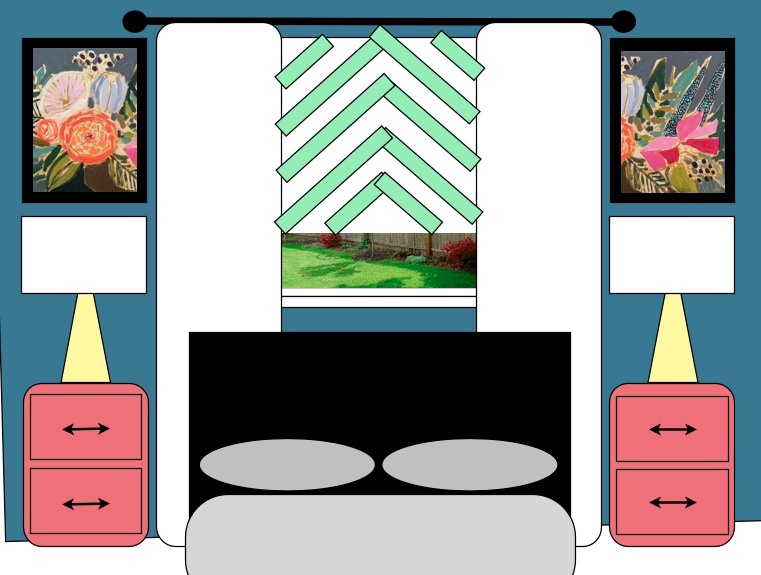 I did a mock-up of the whole room in Pages just to see how everything would look together, along with some more additions to the room that we’ll make in the coming weeks. That little door with the hole in it will house our cats’ fancy litter box. The design isn’t final yet – it all depends on Nick’s progress there and what he figures out as he goes along. That part will be his project. 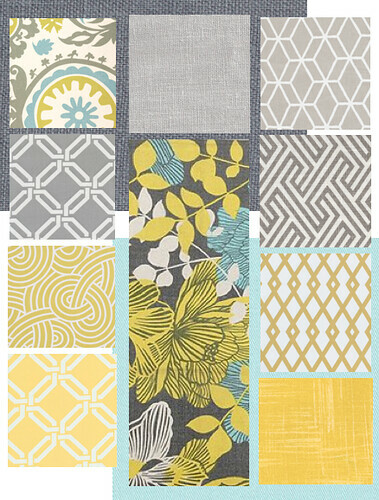 I’ll order the fabric samples just to make sure they look good in person ($1 each at Tonic Living) and continue trying to figure out a lighting solution for the room. I’m leaning towards buying a metal pendant from a big box store and spray painting it yellow. We went to a Salvation Army store hoping to find a pusher for our then 9-month old baby girl and left the store with a new/old retro sofa! Who would have predicted that would happen? Not us. We were not in the market for a new sofa at all, although we were talking about replacing our too-big-for-the-room queen bed in the guest room with a sofa bed. This would give us more walking space in the room and we could even use the rarely-used guest room as a playroom when we don’t have guests. 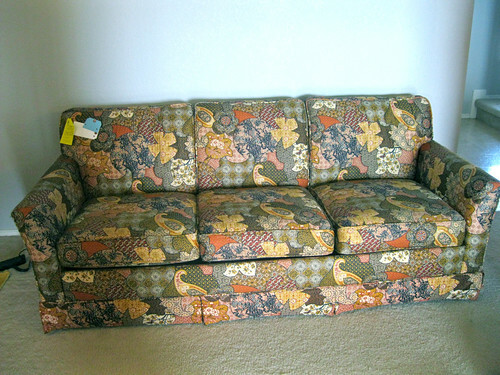 We also have been on the lookout for a small sofa for our office, but we had no real plans to buy anything just yet. 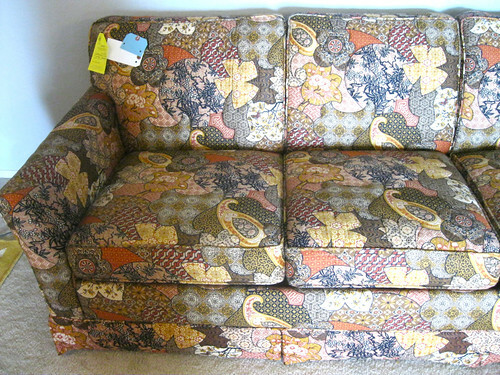 We just fell in love with this retro sofa and the deal was even sweeter when we found that it had a bed in it as well. The mattress is in really good shape. It looks like it’s been barely used. This photo doesn’t really show the colors of the sofa, but you’ll see a better photo soon that really shows what it looks like in real life. The colors include yellow, orange, coral, navy blue, white/cream, and brown. What’s more, the sofa was already professionally cleaned and sanitized! Check out your Salvation Army store if you’re iffy about buying upholstered pieces from thrift stores (bed bugs, anyone?). 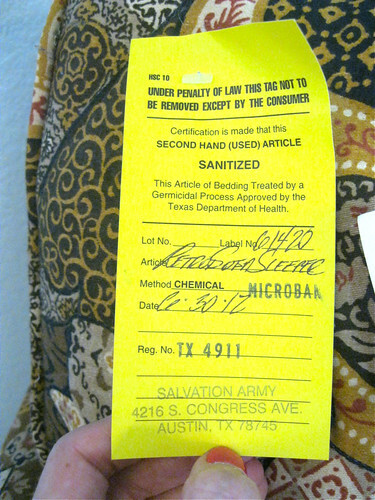 We found a good number of upholstered furniture that were cleaned and sanitized. At first, I thought that the sofa would be perfect for our office, since we need a sofa for that room, too. But then we remembered the situation with our guest bedroom, so we weren’t sure. 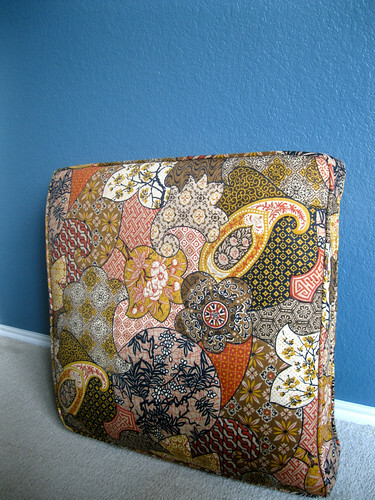 To help us decide, I took a cushion and tested out how it would look in both the guest bedroom and the office. 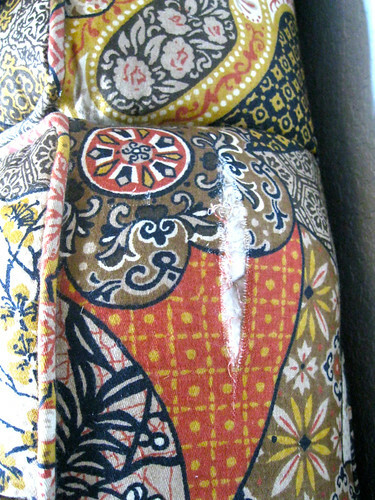 The guest bedroom is painted in Kerry Blue (Martha Stewart) and it really helped the colors in the sofa cushion POP. By the way, this is the best photo that truly shows you the colors of the sofa. Just ignore the blurry and cute baby in the photo, focus on the wall color (especially on the left of Janella’s head) and how it looks with the sofa cushion. No way, right? It just didn’t go. That cemented my decision: the sofa was destined to be in the guest bedroom slash playroom slash exercise room. Hopefully, that will help make that room much more functional and useful for our daily lives. I don’t blame Nick or Sean for this sad, sad, sad incident. I blame the brick wall corner on the exterior of our home. I blame the sofa for being so heavy. I blame our wallets for being too thin to hire professional movers. It’s a good thing that the sofa has such a busy pattern. I’m sure I can stitch it up with a dark thread without it showing too much. Hopefully! I’ll share whenever I get around to doing that. And when I think about it even more, the sofa is just a really perfect fit for the room. 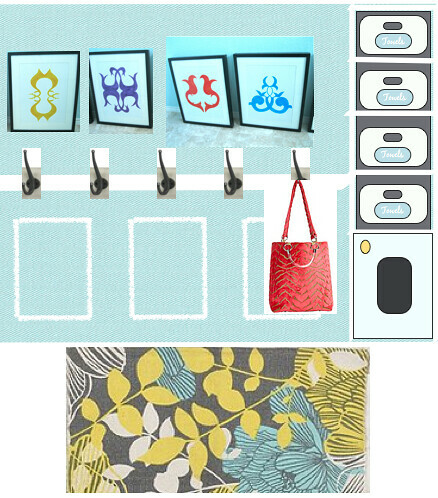 The coral in it will go great with the coral nightstands that are in my plans and the yellow goes well with the yellow lamps that are already in there. Perfect. I’m so happy with the sofa and with its price tag. It was only $200 – a great price for a practically brand-new sofa with a bed in it. It is so comfy to sit in, too. The next step is to lug it from our living room, where it’s chilling, into the guest bedroom, which is only around 10 steps away. I’m really not looking forward to that 10 steps. Actually, before I do that, I’ll have to sell the bed on Craig’s List. I hope to get a good price for it. I’ll need to convince Nick to spend the spoils on house decor, instead of less important things like food and clothing. I mean, right? 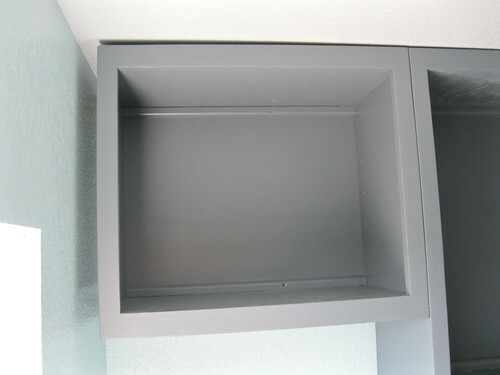 After we installed our laundry cabinets, we were left with two gaps – a huge one on the left and a sloped small gap on the top. Here’s how we covered up these gaps. 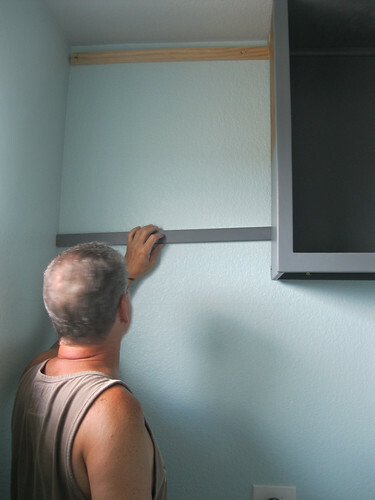 We cut a piece of wood to fit in the gap between the wall and the cabinet and painted it gray. So much painting. My painting clothes are covered with Web Gray. I’m so sick of Web Gray at this point. Nick’s parents flew back to Pennsylvania and we were left behind to finish up the project on our own. Nick pushed up the wood piece into the gap. We originally thought we would glue the wood piece to the cabinet, but the fit was so tight that we figured glue wasn’t necessary. 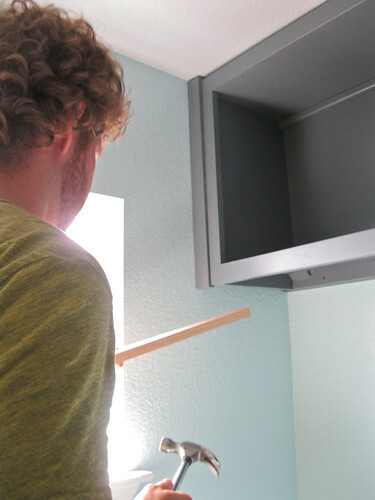 Nick used a piece of wood to hammer on to make the wood piece flush with the cabinets. If he had hammered straight on the cabinets, we would be left with unsightly marks. All flush and ready to be screwed in! Yes, there’s still a gap at the top, but we’ll get to that later. A note – our cabinets are solid, solid wood… VERY solid. Thus, we had to pre-drill all new holes. Here, Nick’s pre-drilling the hole where the screw will go in. Janella woke up from her nap so she joined into the action. But she apparently was still tired… She was reaching for the drill bits and yawned just as I took this photo! So cute. 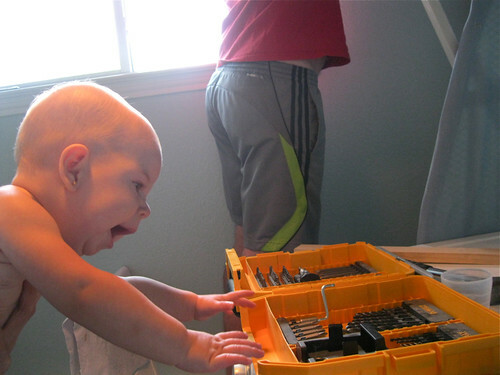 I look forward to having her hang out with us with her toy tools when we’re working on DIY projects in the future. So fun! The last step was to put in molding (or moulding, which is the UK spelling that’s used in Northern U.S. Since we’re in Texas, I’ll spell it molding. Yes, I googled it). 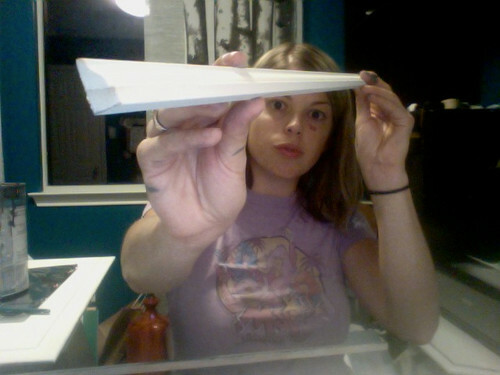 Here’s a dumb and low-quality photo (thanks, Photobooth) of me holding up a primed but not yet painted piece of molding to show you its shape. We cut the corner edges using a saw and a plastic miter box. 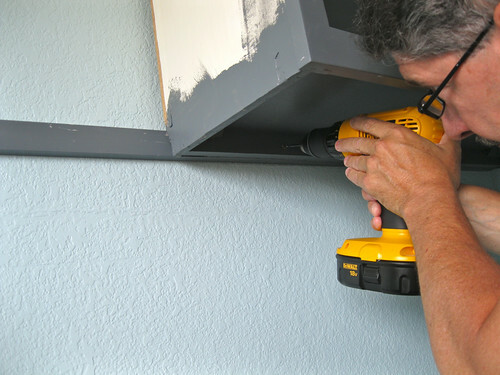 You don’t need a huge miter saw for this simple project. But that doesn’t mean I want one as a gift in the future (hint, hint). See how the molding covers up the gap perfectly? Next up was putting in the finishing nails. 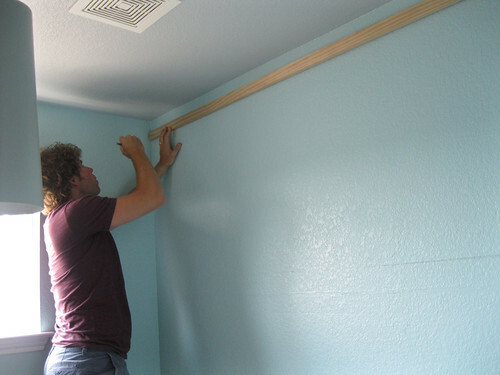 We were scared to do this part… and I really wished that we had a nail gun. In the end, I do think a nail gun would have been MUCH EASIER and efficient and would have given us a prettier result. Nail gun, another possible gift in the future, cool? 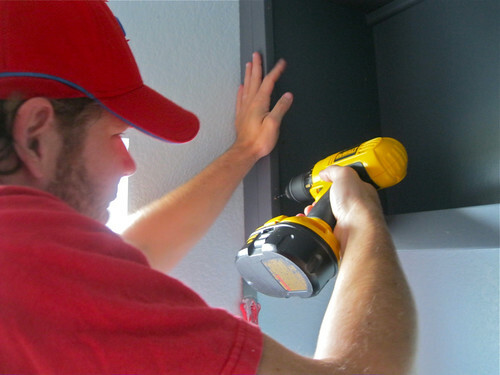 We could have rented a nail gun but this was such a small job that it wasn’t worth the price of rental. 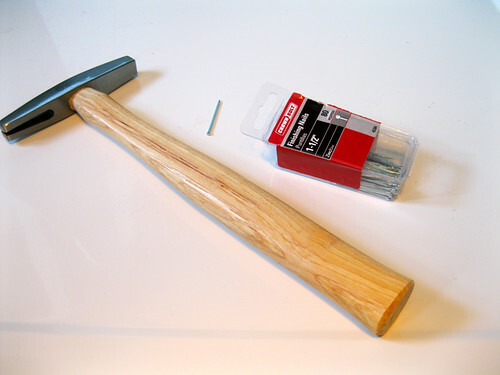 We got this small hammer and a box of 1-1/2″ finishing nails. 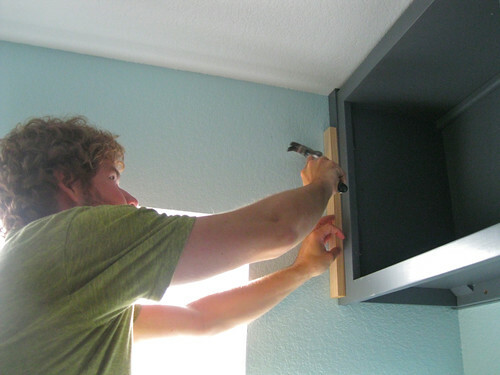 Some tutorials out there say to get 2-inch nails, but this worked just fine for us. The hammer, however, didn’t work so well. We quickly abandoned it in favor of a regular ol’ hammer. The process DID put some dings in our ceiling, but that was easily covered up with minimal drywall putty and touch-up paint. 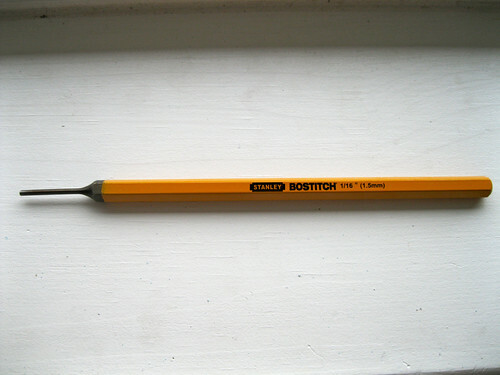 We used this thing.. a nail set, I think it’s called… to drive in the nails some more to sink it lower than the molding. It worked okay. 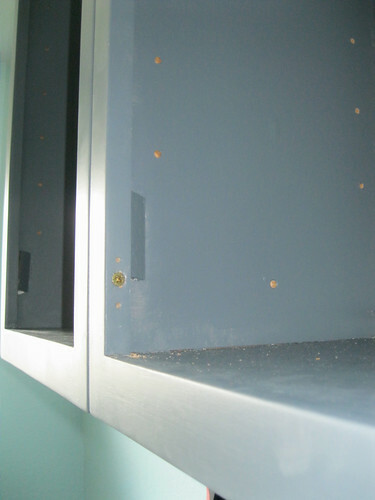 The thing is, our cabinets are SOOO solid that we actually had to pre-drill the holes before hammering in the finishing nails. Ugh. Another reason I really wish we had a nail gun. 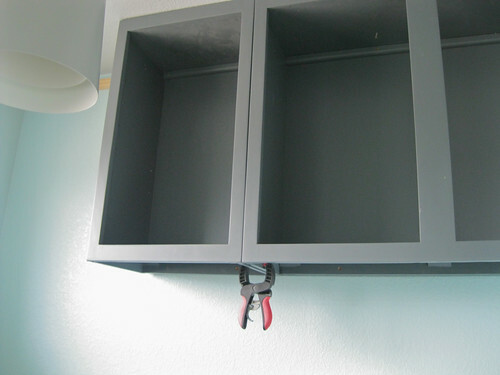 Newer cabinets might be easier to hammer in than the ones we have. Then we filled in the holes with wall putty… because I just DIDN’T FEEL LIKE priming the holes, which I would have to do if I used wood putty. But it doesn’t look perfect. So… I will go back and cover them up again with wood putty, prime, and paint sometime later in the future. When I detox from all the painting I did. But this is a BIG IF because you really can’t see anything unless you look at the nail holes closely. The only thing I’m not sure about is the piece of wood that we added on the left. Should I caulk the space between the wood and the cabinet to make it look like one piece? Or would it look funny in the end? Nick says we should just leave it, but I’m not so sure. I’ll decide later. So happy that part’s done. 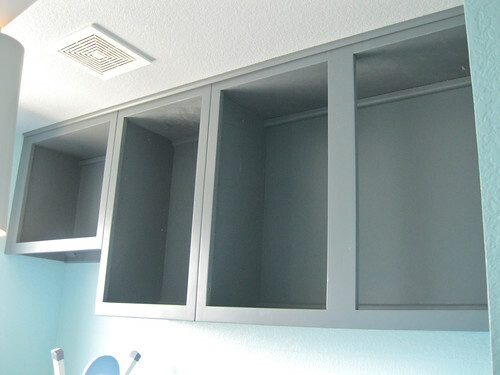 We tossed our towels and stuff in these cabinets and it’s amazing how much these cabinets can hold! There are even plenty of space left and we’re still planning on adding more storage solutions to the room. We do have lots of things, such as toilet paper and paint buckets, hanging out in random places around the house that I would love to transfer to the laundry room. 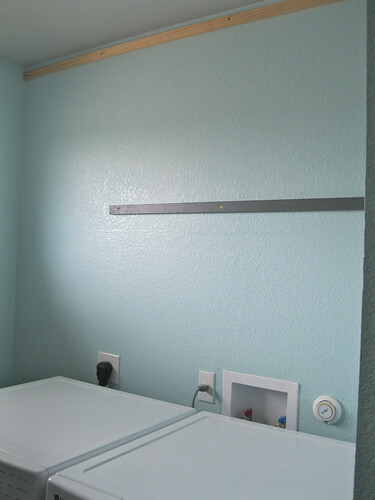 The laundry room is far from done, but the cabinets were a HUGE piece of puzzle and the room is now FUNCTIONAL. So happy. What about you? Would you have done some things differently? 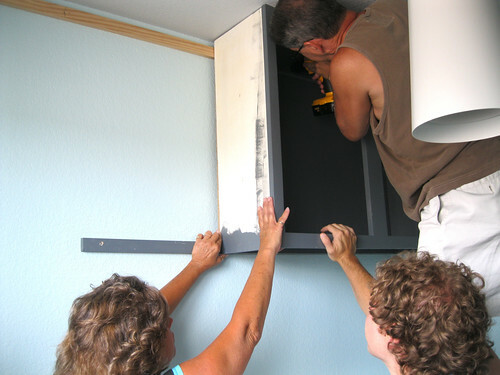 We’re still new to all of this, so if you have any tips for molding or covering up gaps or installing cabinets, share them in the comments! After refinishing the cabinets, it was time to install them. At first, we weren’t sure how we would do it. I did some research on the internet, but so many “tutorials” were vague and made a lot of assumptions that the reader would know how to do a lot of steps. We kept on putting it off… until Nick’s parents visited us in June. 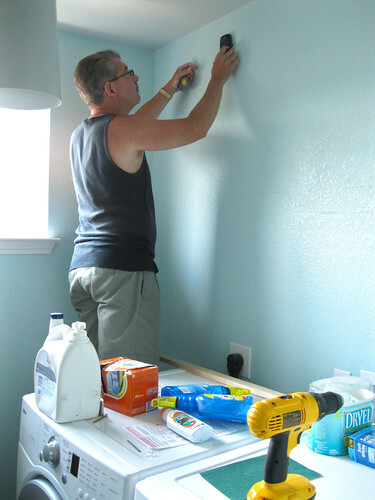 Nick’s dad, Anthony, is a whiz DIYer. He refinished his whole basement, built a deck and a porch, and did countless projects in his home and everything looks professionally done. Anthony, move to Austin, pretty please? The studs just wouldn’t match up. We devised a solution with two long strips of wood. 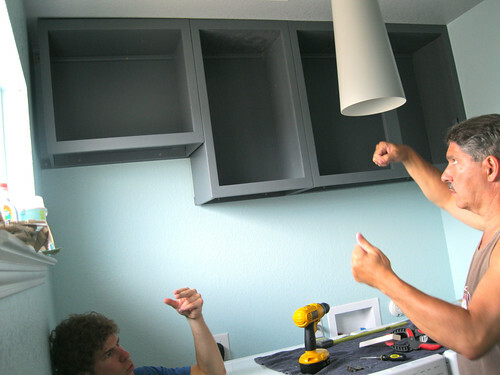 We drilled them into the studs and then drilled the cabinets into them. It worked perfectly! Here is Nick marking out the stud placements on the strip of wood (I think we used white wood for this). Since the bottom strip of wood would be shorter due to the small left-most cabinet, we had to put in a strong anchor to make up for the lack of a stud in that spot. Here’s what it looked when the strips were drilled in and ready. 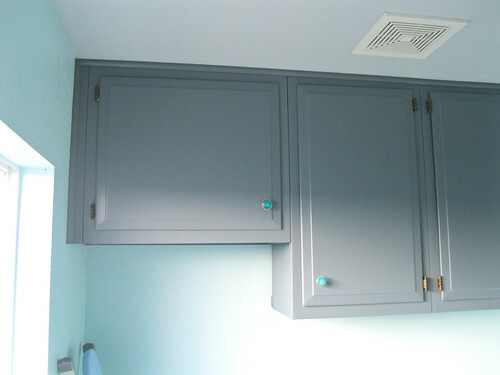 We left the top strip naked of paint because you wouldn’t be able to see it when the cabinets were installed and I painted the bottom strip because… you would still be able to see it. You’ll see what I mean in later photos. 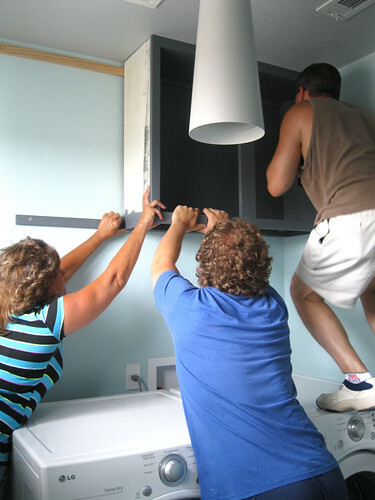 Nick’s mom, Sandi, jumped in and helped hold the cabinet up while Anthony did the drilling. 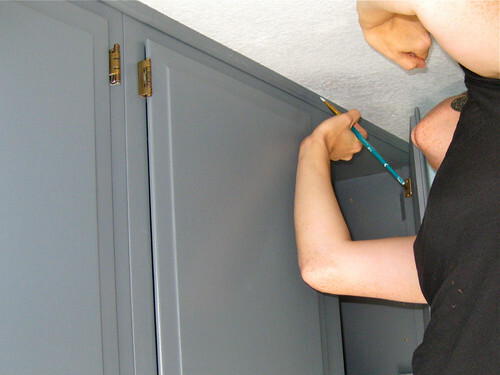 There were already holes in the upper part of the cabinets that Anthony just used again to drill in the screws. We did two screws in the top and two screws in the bottom. 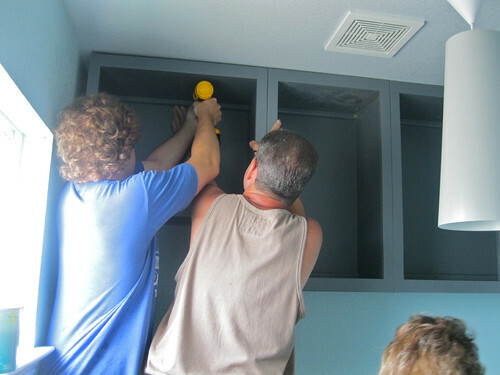 We added the second cabinet and we tried our best to push together the two cabinets. We used a tiny clamp for this, but it worked okay. After we were all done with this project, Nick and I bought a pair of bigger and heavy-duty clamps so we wouldn’t be stuck with these tiny clamps anymore. Oh well! 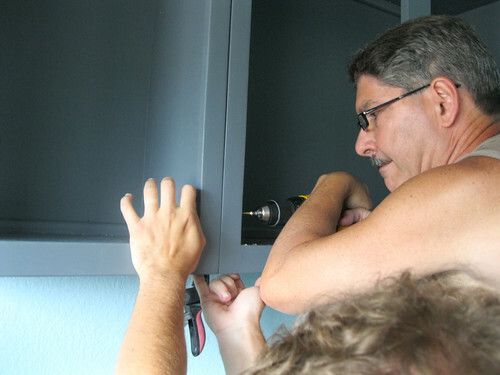 Then Anthony screwed together the sides of the cabinets to make sure everything was secure. The screw was put between the two little holes you see here – they’re for the cabinet door hinges. 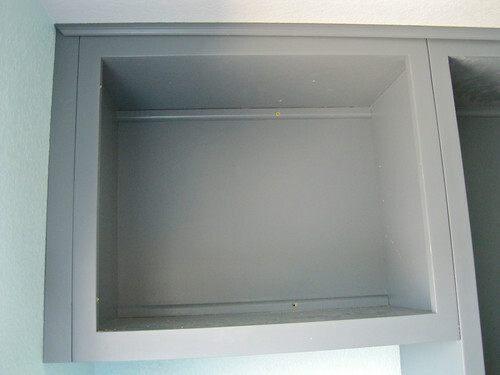 Then we put up the third strip – the smallest and also painted gray – for the bottom of the small cabinet. Finally done with this step! All the cabinets are up and I’m happy. Do you see it? Of course you do. There was a huge gap between the side of the cabinet and the wall. 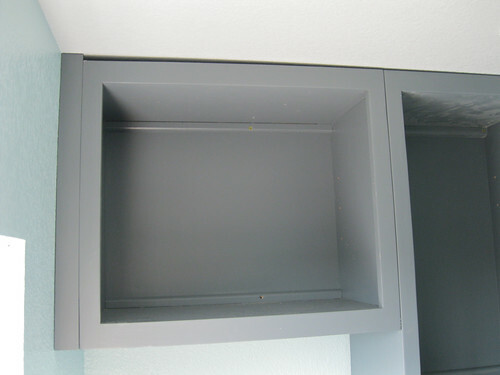 AND the ceiling sloped up so there was another gap at the top of the cabinet. How annoying. Come back on Friday to see how we covered up the gaps. 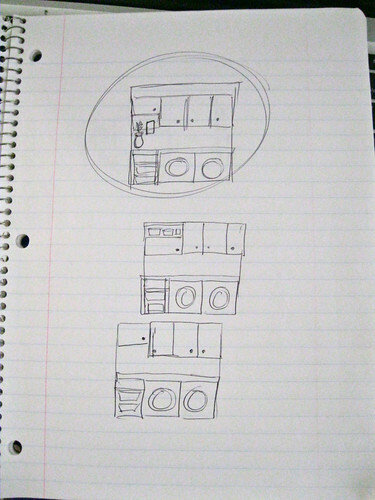 It’ll be the last post on the laundry cabinets for a long while, I promise. I think. Help Deaf Orphans by Donating!